At least 37 people are reported and dead and many others trapped under rubble after a 6.2-magnitude earthquake has hit central Italy. Many of the dead were in the village of Pescara del Tronto which was leveled to the ground and there were fears the number could rise. Much of the town of Amatrice was reduced to rubble and a family of four is feared dead nearby in Accumoli. The earthquake hit at 03:36 local time, 65 miles north-east of Rome. Although it struck at a shallow depth of 6 miles, its intensity was compared to the Aquila earthquake in April 2009 in which 309 people died. The epicenter was around Accumoli where several people died. Some buildings in Rome shook for 20 seconds as the quake struck an area between the regions of Umbria, Lazio and Marche. The tremor was also felt from Bologna in the north to Naples in the south. The highest casualties were reported in the small village of Pescara del Tronto, where 10 people were reported dead, among them children. Other 20 people have been taken to hospital. Two boys aged 4 and 7 were pulled alive from the rubble of the house they had been staying in with their grandmother, Ansa news agency reported. Rescuers said they had been sheltering under a bed. More damage was reported a short distance up the road in Arquata del Tronto. Some of the worst damage was in the town of Amatrice, where at least five died and rescue efforts were under way to find survivors. The main street through the town has been devastated and emergency workers are trying to reach six people in a collapsed building. In Accumoli, a short distance to the north, Mayor Stefano Petrucci said one person had been pulled out of the rubble during the night. Seismologist Andrea Tertulliani said there were sure to be further, numerous shocks that would probably diminish in intensity. 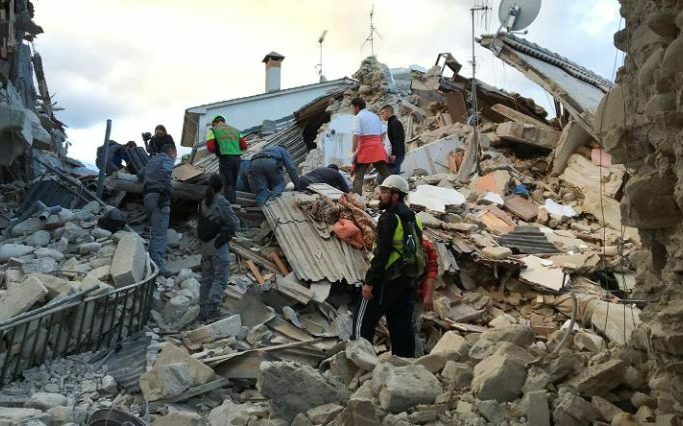 Italy’s Civil Protection agency described the earthquake as “severe”. Rescue teams are being sent to the worst-hit areas, the prime minister’s office said. The earthquake was initially reported as being magnitude 6.4. It was followed by several powerful aftershocks, La Repubblica reported.